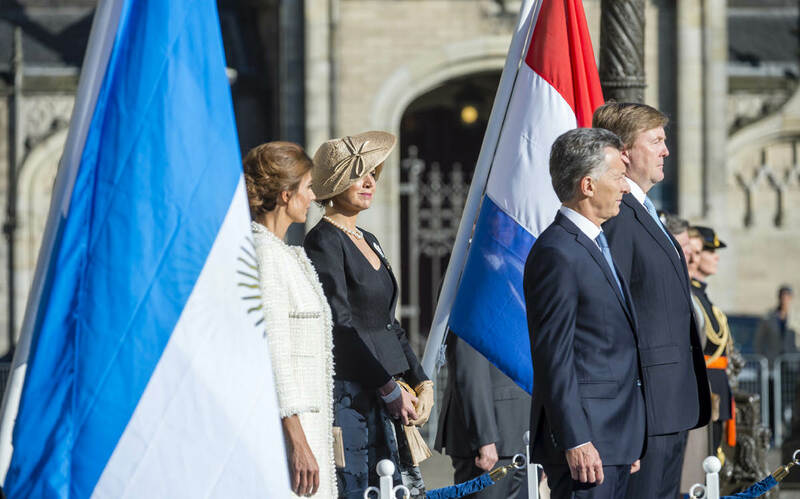 King Willem-Alexander welcomes the Argentinian President Macri on Dam Square, Amsterdam. The Netherlands and Argentina work closely together on numerous international political issues and act in concert on multilateral themes such as the promotion of the international legal order and sustainable economic development. Argentina has the world&apos;s 21st-largest economy. The Netherlands is one of the country&apos;s principal investors and is a key trading partner. Argentina is a G20 member and will chair the forum in 2018. Its recently reaffirmed international orientation is creating opportunities for mutual trade and investment, especially in water management, agriculture and logistics. Partnership agreements between Dutch and Argentinian companies and institutions will be signed during President Macri&apos;s visit. Sport and social dialogue will also be themes of the president&apos;s time in the Netherlands. Argentinian foreign minister Susana Malcorra, other members of the Argentinian government and representatives of the country&apos;s business communities will accompany President Macri. Members of the Dutch government will take part in various parts of the state visit. He will then visit the Anne Frank House, which works with Argentina&apos;s Centro Ana Frank in Buenos Aires to help educate young people about combating discrimination and violence. On Monday afternoon President Macri and Ms Awada will join King Willem-Alexander and Queen Máxima in attending part of the Business Forum, which will be held that day in the Beurs van Berlage in Amsterdam. Dutch and Argentinian Business Forum participants from the public and private sectors will be discussing ways of promoting economic cooperation. There will for example be various panel discussions on agriculture, water management, logistics and energy, as well as a meeting focusing on social dialogue, good governance and the Dutch &apos;polder model&apos;. President Macri, Ms Awada and Their Majesties will take part in a roundtable meeting of CEOs. The visit&apos;s first day will end with a state banquet in the Royal Palace in Amsterdam. Tuesday afternoon President Macri and his wife and Queen Máxima will visit the Port of Rotterdam. Rotterdam Mayor Ahmed Aboutaleb will welcome them to Berghaven port in Rotterdam&apos;s Hook of Holland district. During a boat trip through the Port of Rotterdam, experts and representatives of the business community will describe the various terminals and explain the new integrated logistics solutions provided by the port&apos;s Maasvlakte terminals.